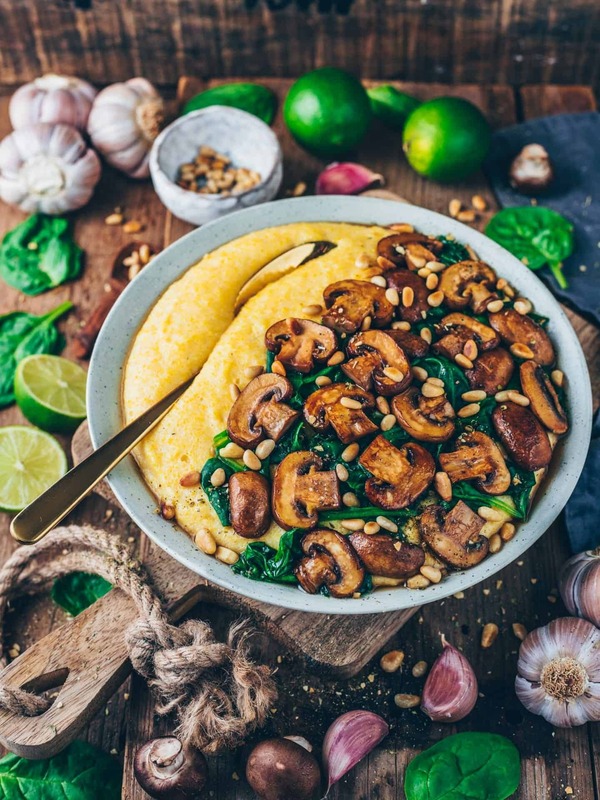 This Creamy Vegan Polenta with Mushrooms, Spinach and Pine nuts makes an easy gluten-free lunch or dinner that is plant-based, healthy and ready in only 15 minutes. It’s also perfect as side dish and you can serve it with any vegetables you like. My perfect simple weeknight meal is usually packed with vegetables and whole foods, that fills me up, and tastes delicious. I really LOVE pasta and risotto, but sometimes it even happens to me that I want to eat something different. 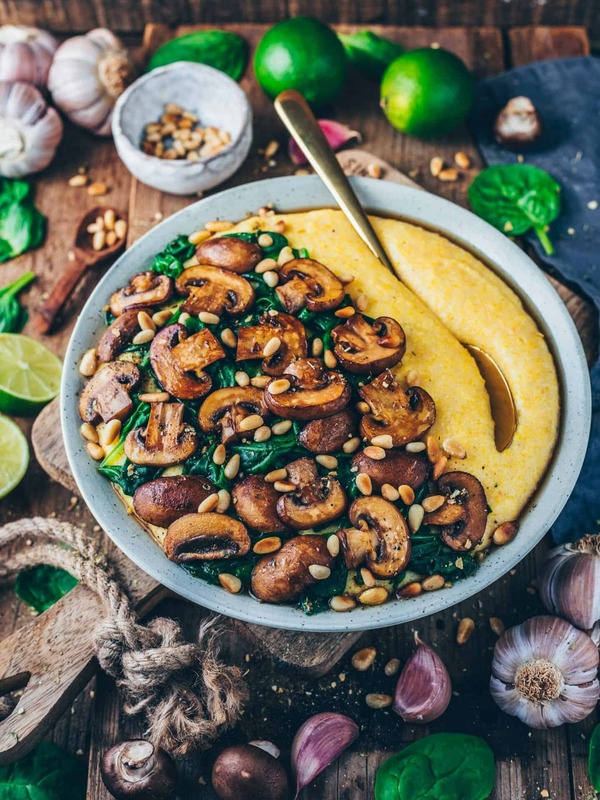 Then this easy Creamy Vegan Polenta bowl comes just right! Honestly, I make it so often because it’s such a perfect meal that you can cook anytime with less effort! To make it even simpler, I prefer using finely ground polenta, that takes only 2 minutes to cook. The first time I’ve made polenta, it was somehow very boring. But after trying some different variations, I fell in love with this delicious dish! It’s so versatile because you can combine it with any veggies and flavors. Anyways, I like it best served with mushrooms, spinach and toasted pine nuts. To make it super creamy I use coconut milk but you can also use any other plant-based milk of choice. 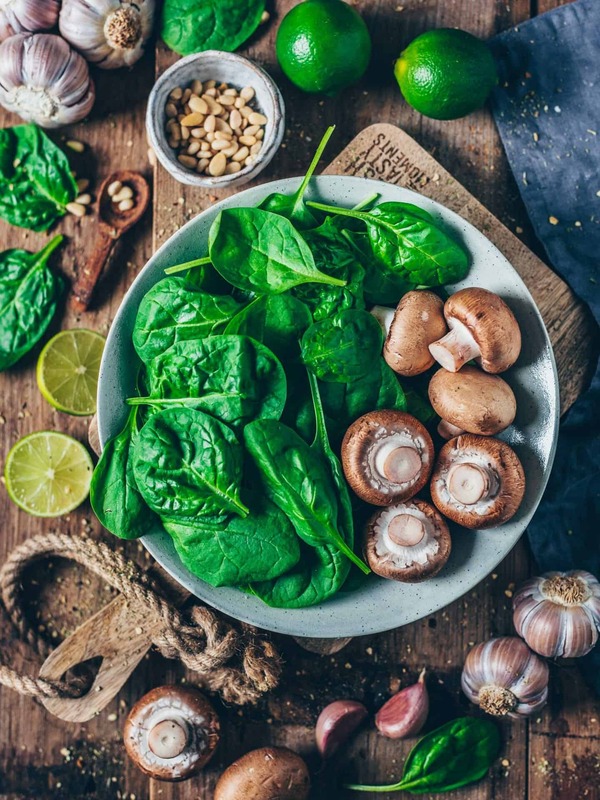 I am probably the biggest fan of Mushrooms and Spinach. That’s why I love adding these vegetables to any kind of savory meals, such as Gnocchi, Pasta, Risotto, Dumplings, Empanadas and more. I also like to use them as topping for my beloved Avocado Toast or homemade Pizza. I mean, nothing‘s better than loading your meal with veggies that are tasty, flavorful and also healthy, right? Pimp your meal with toasted pine puts! Trust me, they’ll add such an amazing flavor! I totally love their nutty taste and would never omit them. If you’re allergic to nuts, don’t worry. You can use toasted seeds or grains, such as sunflower, pumpkin, sesame, buckwheat etc. instead. Also, toasted gluten-free bread crumbs taste great as topping. Feel free to choose the ingredients you like. 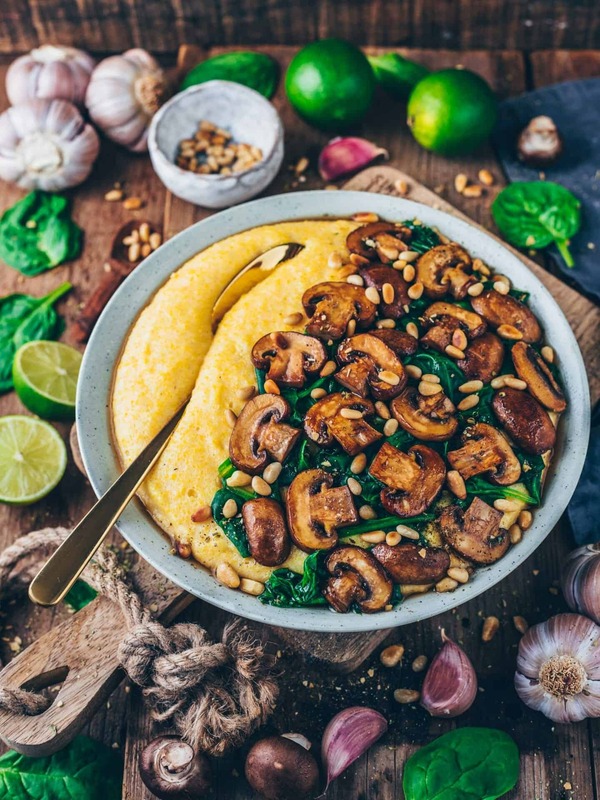 There are so many possibilities and ways how you can serve your Creamy Vegan Polenta. Just be creative! 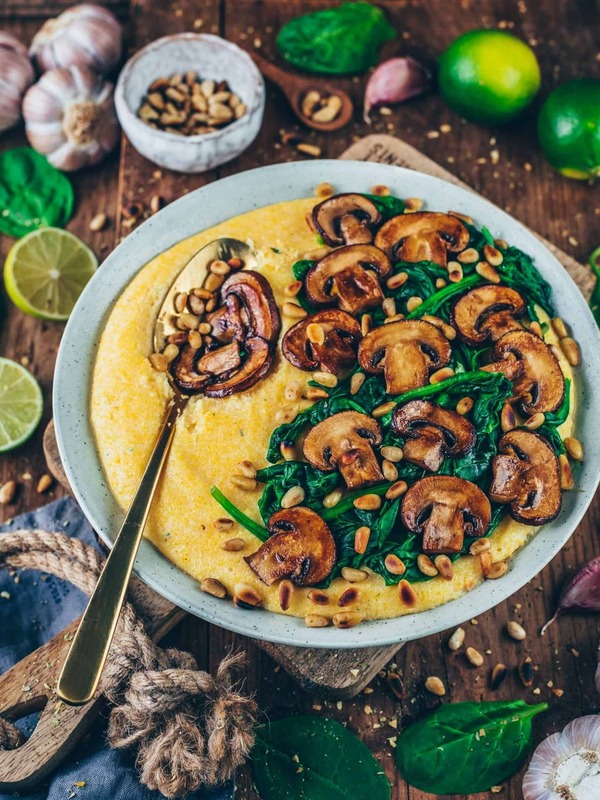 This Creamy Vegan Polenta with Mushrooms, Spinach and Pine nuts makes an easy gluten-free lunch or dinner which is plant-based, healthy and ready in only 15 minutes. It's also perfect as side dish and you can serve it with any vegetables you like. Bring coconut milk and vegetable broth to a boil in a pot. Stir in polenta by using a whisk. Reduce heat to a low simmer and continue to whisk for 1-2 minutes to avoid lumps. Once the Polenta is creamy and smooth, remove from the stovetop. Add nutritional yeast or vegan parmesan and stir (optional). Heat oil in a skillet or pan. Add mushrooms along with onions and fry for about 3 minutes on high heat or until beginning to get golden-brown. Add minced garlic and roast for 30 seconds longer. Then add soy sauce and spinach and cook for 1-2 minutes or until spinach is wilted. Season with salt and pepper to taste. Add a splash of fresh lime juice, if you like. Toast pine nuts in a small pan without oil until lightly browned. 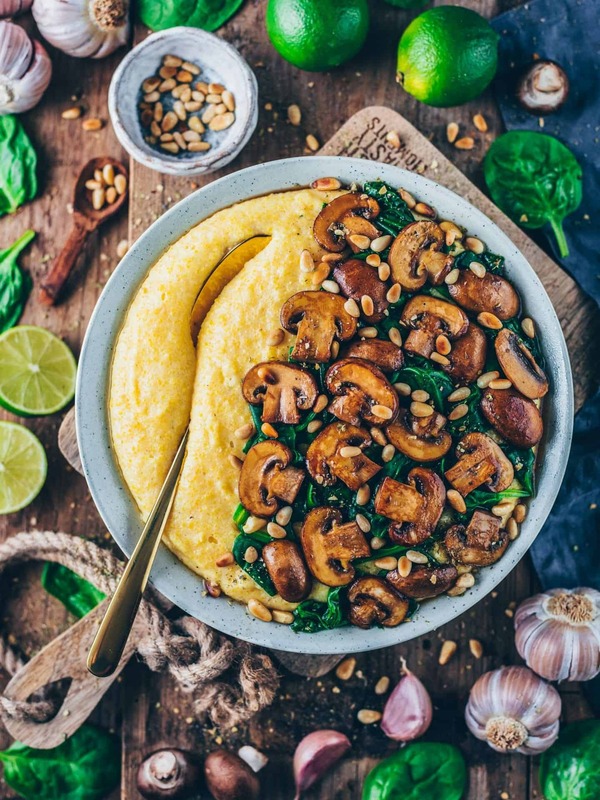 Serve polenta with mushrooms, spinach and pine nuts. To make it even simpler and creamier, I prefer using finely ground polenta, that takes only 2 minutes to cook. If using regular yellow corn grits please read the cooking time stated on the package. Otherwise you could also use cornmeal. Instead of coconut milk you can add any plant-based milk. Add 1 tbsp vegan butter, if using low-fat milk. 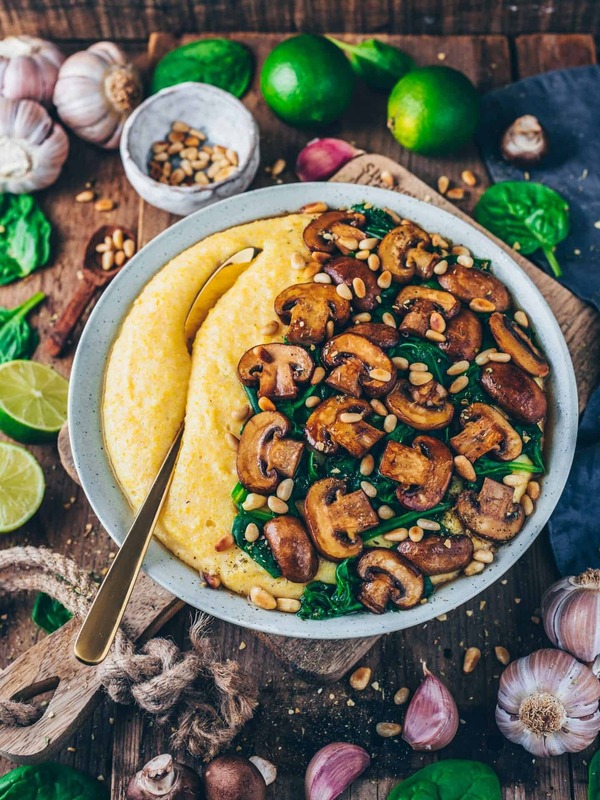 I hope you‘ll love Polenta as much as I do! Actually it was the first time I had polenta and it was so yummy and creamy! I really enjoyed the flavour combination and the addition of roasted pine nuts is just… nuts 😉another great recipe Bianca! So glad that you liked the recipe 😊 I‘m so in love with this dish! Just perfect for cozy autumn days. As a new vegan, l am looking for new foods to try. I never had polenta before. I tried Bianca’s recipe. OMG it was so good. Also very simple and quick to do. Hi Bianca! My 29 year old is Vegetarian, mostly vegan plant based and tagged me for this recipe. My mouth was watering! We made it for my 52nd birthday. My choice for dinner. It was super delicious. The polenta was a nice change. We thought to throw in some sun dried tomatoes and serve over a pasta or rice next time. Will make again for sure! My favourite dish at the moment! So easy, quick and just amanzingly delicious <3 Already ate it twice this week. And I think many polenta dinners will follow… hihi! Thanks for this recipe! Made a double batch for company and everyone loved it. I was a little short to double the mushrooms and spinach so I roasted some brussels sprouts for some extra veg and it worked out perfect. I never would have thought to make polenta with coconut milk AND broth, totally amazing and creamy! 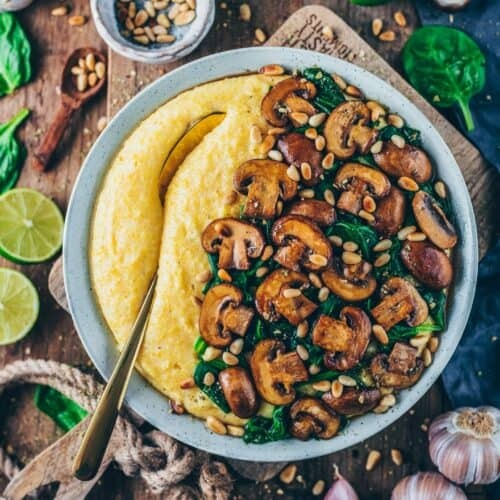 So happy that you like this polenta recipe! Made this on a chilly Canadian fall night after work. (1) Was SO fast to make (2) Was SO warm and comforting (3) HELLO SO DELICIOUS. So easy with so much flavor I could cry. Had it for lunch the next day and the flavors had developed even more. I love love love this recipe! I’m a new vegan and I’ve been really pleased with the variety of new meals I’m eating that I wouldn’t have tried before. This is so yummy! Thank you for the recipe! How amazing 🙂 Easy to make and perfect for diner ! Thank you can’t wait to try your others recipes ! This is a wonderful recipe. I am following an Ayurvedic diet and this was perfect for me and my family. Sooooooo good!! Oh my god this dish is so tasty! Made the polenta last night and it was so creamy. Really liked the seasoning on the mushrooms too. Didn’t have any lime juice so added some capers and chilli flakes which worked well, and used cauliflower and kale as I was out of spinach – such an adaptable recipe that I’ll definitely be using it again! Amazing recipe! It was my first time with polenta and it was so easy and perfect for lunch! So creamy and tasty for such a cold day here in Galicia! Thank you so much for your work, I’ll try more recipes soon! Thank you so much, my dear Noelia! Can we keep creamy polenta in the fridge ? If yes how can we heat it again ? You can heat up Polenta in the microwave but I recommend to serve Polenta immediately because it gets firm after cooling. I made this for thanksgiving and my family really liked it! I forgot my nutritional yeast so I was a bit bummed about that but it still came out great. I also doubled the recipie and had to add some corn meal in the end to thicken it a bit. So glad that you like the recipe. 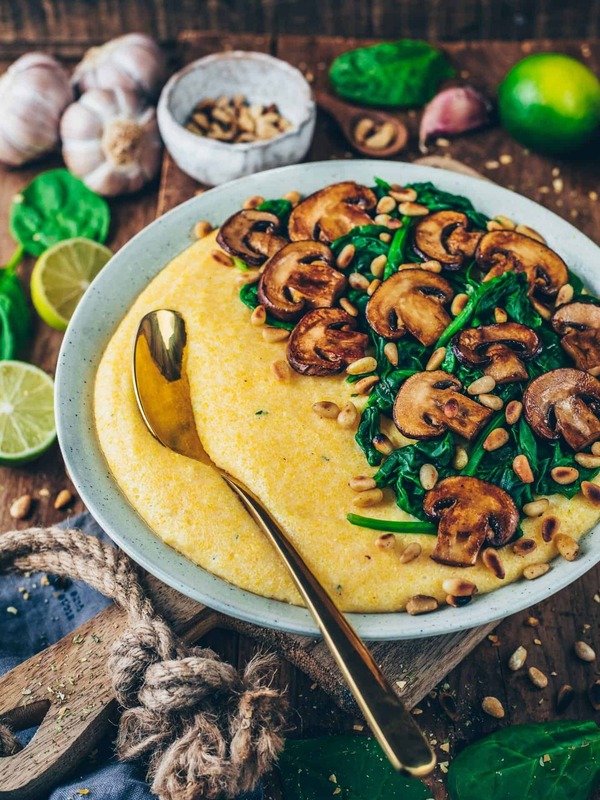 I made this creamy polenta and it was a hit!! Delicious and super easy to make. I always love your recipes! I made this recipe yesterday and we liked it. Might try a different type of milk (I don’t care so much for coconut). But the creaminess of the polenta was great 😊 Next time I might also add some different spices to the polenta and more veggies. Definitely try it out. You can use any milk and veggies to your wish. Such a quick, easy and tasty meal. 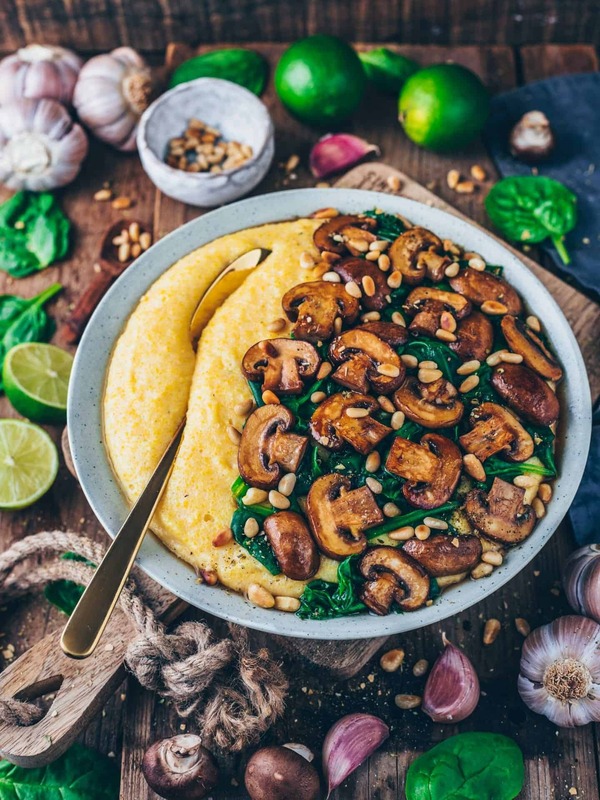 The polenta is real soulfood. Thank you for the recipe. Love it! Great recipe! Can’t wait to try out more of Bianca’s! I’ve only ever seen polenta in the cold vegan/vegetarian section at my grocery store. It comes in a tube of about 16 oz. i believe it is usually sliced and fried to make polenta cakes. 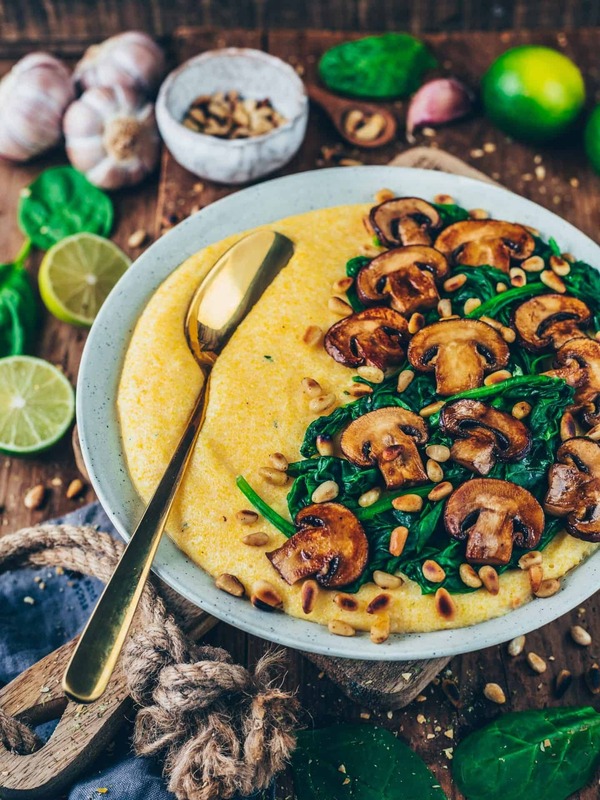 Is this the same polenta you used in your recipe? honestly, I don’t know what you mean exactly. Polenta is coarse corn flour. It’s like fine corn grits. Such a good recipe !! This is one of if not my all time favourite vegan recipe right now! It’s so good with multiple layers of flavours. It’s amazing!!! I love this polenta so much! So glad that you like it too 🙂 Thank you! We tried this recipe tonight and everyone loved it! I don’t think I’ve ever had polenta before, but I really enjoyed it. It was tasty and filling- and the mushroom/spinach topping was SO GOOD! Thanks for another great recipe Bianca! This recipe was absolutely delicious! It was simple to make without tasting simple and my whole family loved it! I would definitely make this again and use this as a guide in the future. Soooo good! I used almond milk was just fine. Perfect balance, lime is necessary. Pine nuts give it texture. Loved it!